Freeman Beauty is a company that I have used in the past for their wonderful shampoos and prices very reasonable. As a member of Klout, I sometimes receive items to sample due to my, as they say, "influence". If you are not signed up for Klout, it doesn't hurt to do so as you never know what you may receive! When I saw a perk was from Freeman Beauty's new Eclos Anti-Aging Skin Care Line, I was quite thrilled. The more articles I read about skin care, you really do not need to spend $600 on a face cream. There are many products out there in your local drugstore that work quite well. They are all getting smarter in researching what works best to care for your skin than say 20 years ago. 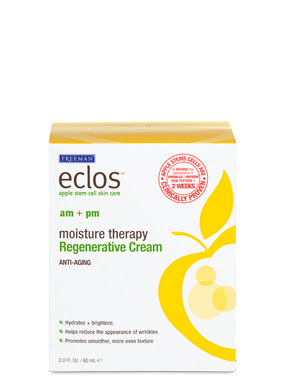 The Eclos line is very affordable and uses apple stem cell technology to help the wrinkles disappear. An SPF is important for EVERYONE at ANY age. The earlier you start with it, the better. Winter, Spring, Summer and Fall - everyday should start with an SPF cream on your face. This product is a dream for those who do not have a lot of time on their hands. 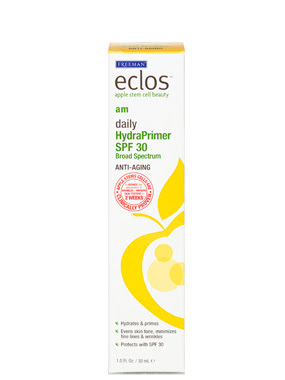 It is a primer with SPF 30 and helps with anti-aging. • Apple Stem Cells to help reduce appearance of wrinkles + improve skin texture. • Soy to hydrate and firm. • Iron Oxides provide a light tint; Broad Spectrum SPF provides UV defense. • Antioxidant Vitamin E helps scavenge free radicals. 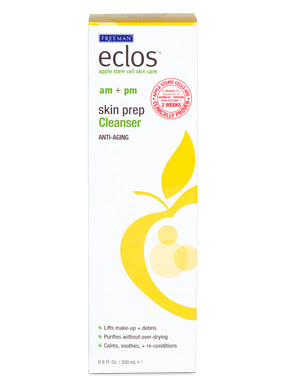 The cleanser is great to use for morning and night, which again saves time from using 2 different products. We all need more time in the morning, so anyway to speed up our skin care routine is a big plus to me. My face felt very clean after using this product yet smooth as well. • Ginkgo Biloba, Turmeric + Green Tea to help guard against free radical damage. • Chamomile to help revitalize and hydrate skin.• Cucumber to soothe skin stress. Again, this great anti-aging cream is for use am and pm which makes for such an easy routine. I also think these products are great for travel as you don't have to take more than one item for your day and night skin care routine. • Palmitoyl Glycene, which acts as a skin nutrient, helps minimize signs of aging. I noticed my skin to be very smooth and bright after using these products. It is so important to take care of your skin from a young age, so you can look fabulous as you get older. Using products that contain good ingredients is what it is all about, and Freeman Beauty has nailed it with their Eclos Anti-Aging Skin Care. 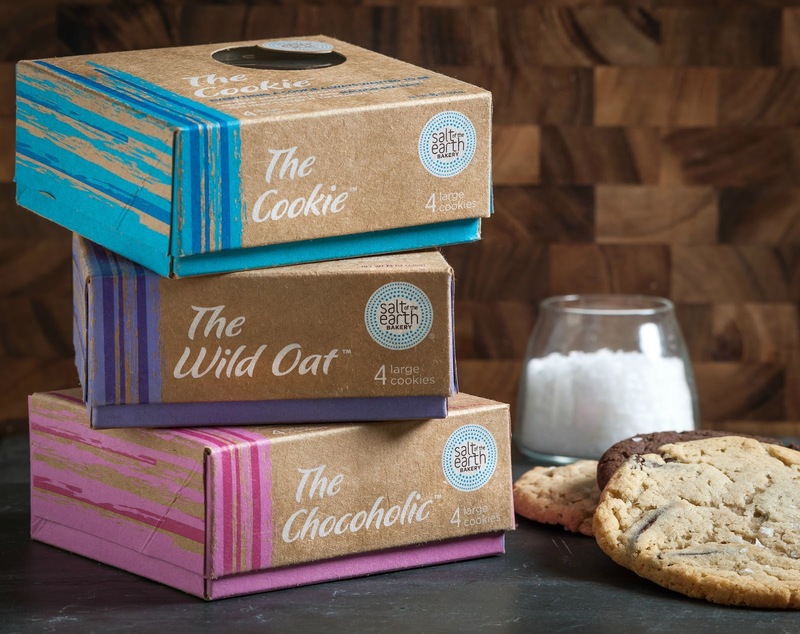 You can just try one product first and see how you like it. I usually like to do that as opposed to purchasing the whole line right away. 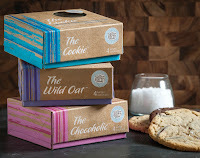 I think you will be very pleased with the results of these products!! Disclosure: I received one or more of the products mentioned above for free in the hope that I would mention it on my blog. Regardless, I only recommend products or services I use personally and believe will be good for my readers. I received that same perk! I'm trying it out now. Glad you liked it. I'll have a review in about 2 weeks.